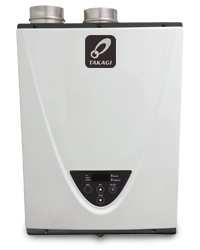 Takagi Tankless. The T-H3-DV-N is well suited for residential/ commercial applications such as small restaurants and beauty salons. Complies with Ultra-Low NOx regulations. Utilizing HRS35 copper alloy for the heat exchanger tubing, the T-H3 is also suitable for heavier residential usages such as space heating or domestic recirculation systems. Remote control included as a standard feature. Certified up to 10,100 ft. altitude.